Credit to MattAces and JB2448 ! It also confirms that it'll be purchaseable digitally on Amazon, Google Play Music, and iTunes, so that's all of the major digital music retailers (but not available for streaming on services like Spotify). It'll also be available in high-resolution audio from e-onkyo music, mora, music.jp, and RecoChoku. Up until now the digital version of the Soundtrack had only been specified for a Japanese release, though one could probably obtain it by switching their iTunes over to Japan. But it's nice to see that the release will be worldwide and available for all to buy simply. Check out this thread for a Breakdown of each individual composer (Mitsuda, Hiramatsu, ACE, Kiyota) and their contributions to the OST. Glad to see this happen. Still surprised all Nintendo games don't have full sound track releases. I'm just relieved they're doing it in this case. this Soundtrack is 105 songs huge and the work of 5 talented composers. It'd have been a real shame for it to not have had a widely available release. 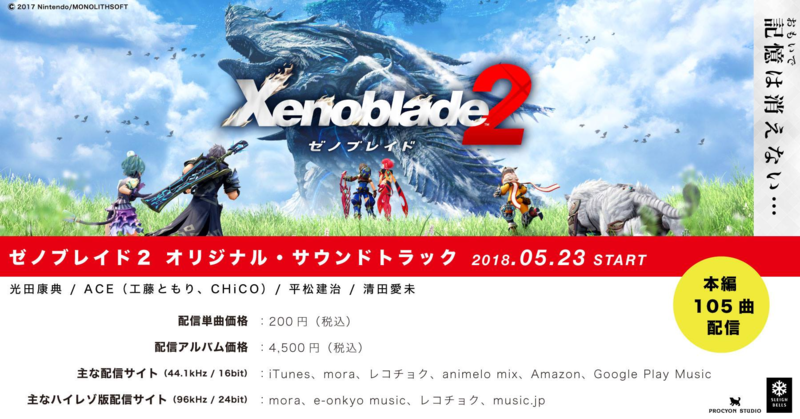 Though I guess i shouldn't be too surprised since even Xenoblade X's OST was given a wide digital release too. To whoever made this possible! Thank you to whomever made this happen! This is huge. Hope it starts a trend. Not on Spotify? That' really disappointing. I’ll buy this, but I also want iTunes releases for Mario Odyssey, Splatoon 2, and Breath of the Wild. Time to pop out my DAC, hoo boy. Apparently it's not. If you read the production notes for this OST, they said it was so expensive to produce that they barely make any money on it at all. And they even lose money on the more expensive collector's editions. They said the reason it's so expensive is all the staff time they have to pay to put together this soundtrack. I don't know what's involved in a release like this myself, but apparently it's a pretty intensive process. Very nice! Would have imported anyways but now I don’t have to. Oh nice! XB2 has such a good OST. Death Match with Torna is the best track. This'll probably be the first complete digital soundtrack I've ever bought. Usually I'm a fussy git and only buy one or two songs. counterattack is the best song ever. No Spotify is sad but I’ll get this. Damn, no Spotify. Don't have the money atm to buy this additionally, already getting too many games this month. Don't want to skip Battle Chasers even though the XB2 OST is GOAT. Making the actual sound track is definitelt overly expensive. But at this point, that's a sunk cost. There's no reason for them not to upload it on services where people can pay for it to recoup costs. Excited to get my hands on my collectors cd soudntrack. Nice, I thought I’d have to buy that USB. I definitely am not aware of the costs involved in a soundtrack production. It sounds like it isn't as simple as taking the source music files and putting those together. I would guess there has to be some mixing and editing done to optimize both for space and quality. And with 120, or 105 at least, tracks to work with, that definitely requires a lot of time to go through. And then you'd have extra costs and fees for any of the physical copies. Whoever lucked out and snagged one of those very limited physical editions definitely has a rare valuable item. The sad bit is, I have no idea when I’ll get my Type-B physical edition. I ordered it from Amazon JP and am not sure sure how long it’ll take to arrive in the UK. I'm in. Xenoblade 2's soundtrack is one of the best I've ever heard, and I'd like to see more digital releases of this sort from Nintendo. Nice hopefully this paves the way for more Nintendo games to have their soundtracks published and sold. Oh hell yes, happy so see this and I really hope this sets a precedent for Nintendo games from now on. You unlock tracks by opening Cores. 0.7% chance of getting Counterattack confirmed. Amazon Japan deliveries are insanely quick, you'll have it in like two days, maybe even the next day, maybe 3-4 days worst case. Mine says "Will ship May 23 , Arriving May 26 - May 28" for example and they're usually generous with the estimation. Excited to get my hands on it as well as all the goodies. Subscribed. If I can't get the type C OST with the Morag postcard, I'll get the soundtrack from Amazon. I used to work with production in the music industry, and I can tell you it can be pretty expensive just for a digital release. The cost of mixing and mastering engineers are pretty expensive, and for many instrumental albums, is the largest single cost of a project. You'd be surprised how long it takes to master even one track. Usually, soundtracks like this in a game is merely incorporated by the sound engineer, who you are already paying. Google Play/Apple gets a cut from these songs, which can raise the number of songs/albums you need to break even. At the most forgotten element, it takes a team of people (I used to do parts of this in an earlier life) to do the artwork, album credits, and other legal language that might have to be in the track info and registered with performing arts unions. You are paying employees to do all these things. Nintendo is not a record company, and has to outsource all of this to someone that can do releases on all digital platforms, and Nintendo's quality standards. So should Nintendo do this more? Yes, but I think people greatly underestimate how long it takes an album, especially an instrumental album, to break even. Some of the artist you love have probably never broken even on album sales, but made their money performing in concerts or making appearances.